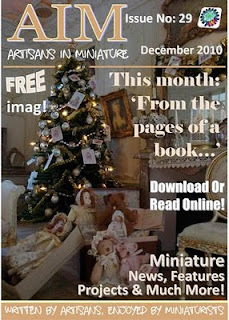 Artisans in Miniature: Decembers Edition of the AIM Magazine is out NOW!!! Decembers Edition of the AIM Magazine is out NOW!!! This month's issue is our biggest yet, ensuring that the AIM Association finishes the year on a record breaking high! Our cover this month features the work of Christine-Lea Frisoni and inside you can read about and see more of her work. There are also features from Marianne Colijn, Eileen Sedgwick, Annemarie Kwikkel, Sara Scales, Julia Jeffreys, Jean Day, Emmaflam, Sally Watson, Ana Maria Villalon, Wilga van den Wijngaart, Maia Bisson and Lee Ann Borgia as well as all of our regular features!!! I think you will agree that this month's issue is the biggest and best yet!